The rooms in question are not an interconnected maze of areas where one can come and go as they please. Instead, Paul Fahy’s team has built five segregated pristine white boxes that are spaced apart within the confines of a clinical open black space. The only distinguishable difference in the boxes is a title for each box: ‘Room 303, Bathroom, A Girl’s Bedroom, Office 33A, and Kitchen’. Divided into five groups of six, Rooms instantly becomes a close-knit, intimate affair. 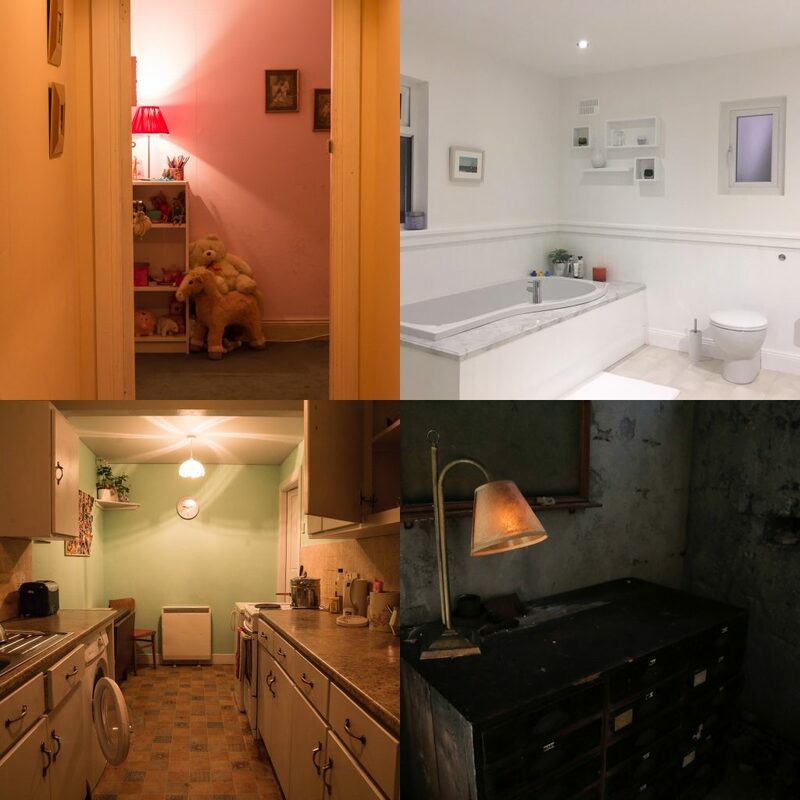 The impersonal space between boxes gives an omnipotent impression, that we are silently drifting through a limbo, visiting people’s lives in some of their most vulnerable states, sharing in their definingly human moments. However, the clinical environment is instantly subverted upon entering the rooms. Each with a distinguishable smell, we begin to explore the detailed spaces in silence before a recording begins, initiating the monologue. Each box has its own contrasting, yet completely believable style. A particular standout is Office 33A’s rustic desks and peeling ceiling that screams asbestos. Or equally, Room 303’s cracked walls, chipped furniture and dim lighting brings back many a gloomy memory of staying in a cheap hotel. The speeches themselves are all written by Enda Walsh, some more captivating than others, a particularly vivid is A Girl’s Bedroom. Performed by Charlie Murphy, a young girl describes her journey, leaving her home in the middle of the night and walking continuously. She leaves the suburbs behind into the countryside, trailing the coast, venturing into the unknown. The further she strays from the room we inhabit, the more the lights dim. Designed by Adam Fitzsimons, dimming lights slowly engulf the room in darkness, we step into the black abyss with her.